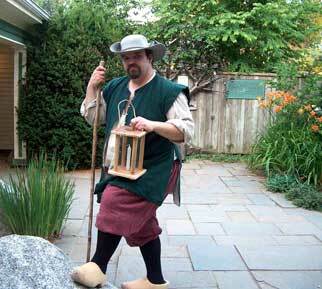 Five-Century House Tour in Canada’s Oldest Town! This summer’s “must attend” event for house and history buffs alike takes place on Saturday, August 28th in Annapolis Royal, Nova Scotia. 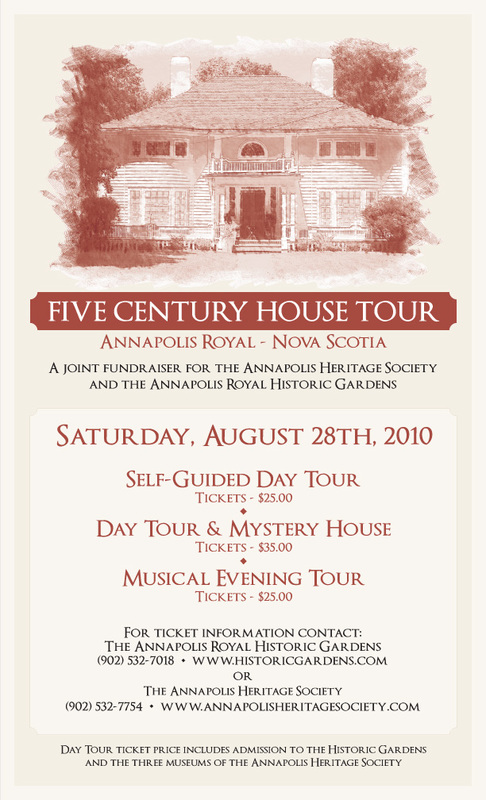 It’s the FIVE-CENTURY HOUSE TOUR, a major fundraiser for the Annapolis Heritage Society and the Annapolis Royal Historic Gardens. 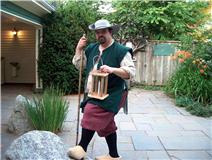 The FIVE-CENTURY HOUSE TOUR has two wonderful components: The Day House Tour and the Evening Musical Tour. Tickets for each are $25. The Day Tour features six houses, open from 10 am until 4 pm, representing the five centuries of built heritage in Annapolis Royal: the 17th century Acadian cottage; the delightful 18th century Bonnett house, never before open to the public; the 19th century Runciman House, sensitively refreshed since its sale by the Heritage Canada Foundation to private owners; the charming 20th century Arts and Crafts Pickels-How House and the sweetly simple 20th century Colonial Revival Foster-Nicholson House. In addition, you’ll view a 21st century home– the Langstaff House, a vibrant reproduction in the 1880s Victorian Stick/Eastlake style. The house guides, all volunteers, are dressed in period costume. The Evening Musical Tour provides a cultural experience with elements of music, food and heritage. The properties involved include the Historic Gardens, reflecting the peaceful co-existence of Acadians and First Nations peoples; St. Luke’s Anglican Church, the Fort Anne Garrison church, celebrating 300 years of the Anglican Church in Canada; and the O’Dell House Museum, where Annapolis Royal’s “Golden Age of Sail” will be the focus in a “Sea Shanties and Cider” interpretation. This entry was posted in Explore Annapolis Royal, Gardens, Heritage, Tours. Bookmark the permalink. 2 Responses to Five-Century House Tour in Canada’s Oldest Town! Hi Joe. Thanks for your kindness and patience in posting your comments on our blog. I apologize for the problems you are encountering and will try to have someone who has more technical expertise than I do to try to figure out what is causing the error message when you try to post. I’m delighted you are enjoying our blog. Thanks for your perseverance and interest. By the way, I like your Mark Twain quote. That’s a good one. He used to visit Annapolis Royal in the 1800’s. I’ll bet he got some of his inspiration from our very own Annapolis River, not all from the Mississippi.